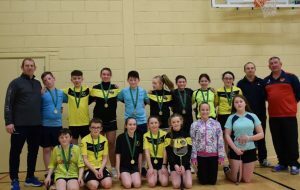 IT was a thrilling night of Community Games badminton in Ballon Hall last Friday where six teams competed for the boys and girls U15 county badminton finals. The Myshall boys team held onto their county title with competitive wins against Borris/St Mullins in the semi-final and St Lazerian’s in the final. The Myshall boys have won the national title for the past two years so were always going to be difficult to beat with three of last year’s team still playing on the current team. The final had everyone on the edge of their seats, so close were the matches. The girl’s title also went to Myshall this year after they beat the county title holders St Lazerian’s in the final. St Lazerian’s won the semi-final against Ballon/Rathoe and were very strong contenders. Again it was an exciting final with very little between the teams and a credit to all players involved. The standard of badminton at county level is rising each year which is a credit to all the players, clubs and mentors. It was also the highest attended county final in many years and it is wonderful to see the support that was given to the children by all who attended. The children were fair and sporting in all their matches and are a credit to themselves and to their areas and clubs. We wish the Myshall boys and girls’ teams all the best representing Carlow at the next stage. Thanks to all of the players, parents, managers, clubs, Ballon hall committee, Carlow Community Games and to everyone who helped on the night. Thanks also to Rita Rutkauskiene for taking the photos, Aisling Kavanagh for her badminton expertise and to Louise Coles and Patricia Nolan for providing the refreshments.